The Synthasystem runs off of a rather odd power configuration: +12V/-10V. Thankfully, David has made provisions on his PCBs for regulators, so you can run the system off of +/-12V or +/-15V, and each module will take care of its own power requirements. (Both MOTM/Blacet and Doepfer power headers are available too.) There's a pair of trimpots to set each voltage correctly. On the smaller modules the power regulation is directly on the PCB. 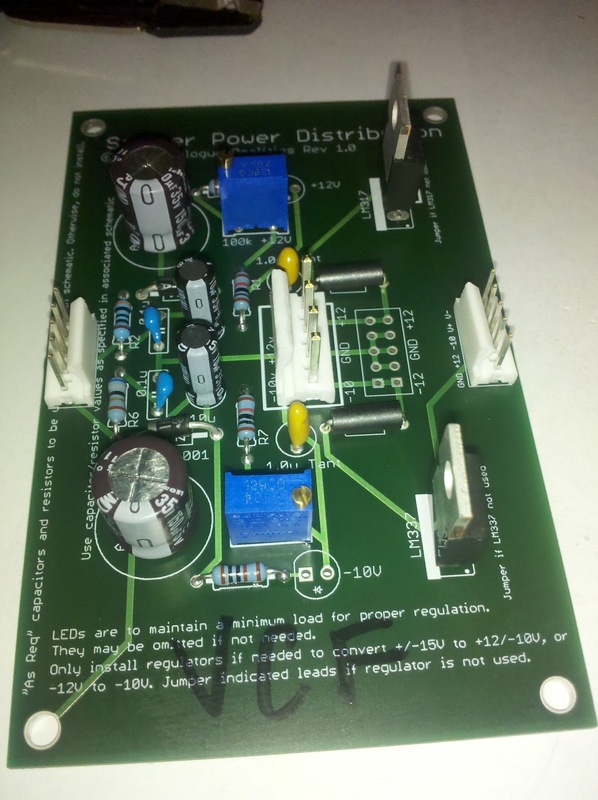 Most of the larger modules, however, use a generic power regulation PCB. I'd recommend labeling the PCBs for what module they're used with - there's a couple of resistors and caps which change (or are omitted) depending on the power filtering requirements of the module. 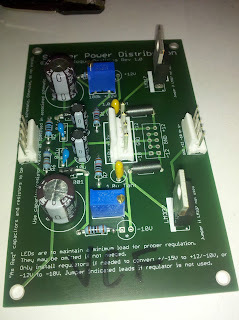 It is a really simple build, and the power regulation sections on the smaller boards are similar. I'll be adding heatsinks to the LM317 and LM337 later. You'll note that I've omitted the Doepfer power header, and two LEDs. The LEDs are only really there to give some load if you're testing and configuring it without any external load. Actually, I intended to add them, but I goofed and forgot them in my giant Mouser order; I installed the associated resistors in case I ever decide to add them.